It is advisable to stick to mid-caps with sustainable financial metrics rather than those offering the promise of faster growth. Krishna Kant, Ram Prasad Sahu, Hamsini Karthik, Ujjval Jauhari and Shreepad S Aute report. 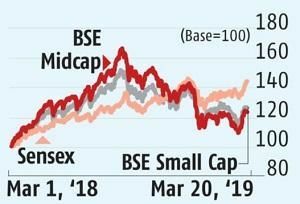 As foreign portfolio investors raise their bets on Indian equities, mid and small cap stocks too are back on the radar after underperforming the benchmark indices during the greater part of 2018 and the first two months of the current calendar year. For example, the S&P BSE MidCap index is up 10% in the last one month after declining by 24.4% from its record high levels in January 2018. 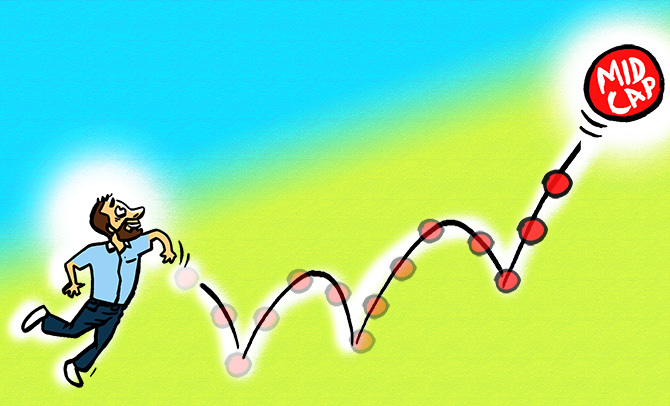 In comparison, the S&P BSE Sensex is up 8% in the last one month against 8.3% correction between August 2018 and February 2019. This is good news for domestic retail and high net worth investors who largely invest in second and third tier stocks. Their interest in mid and small cap stocks is not surprising. Though these stocks are riskier and more volatile than their large-cap counterparts, they also offer faster growth opportunity and handsome returns if bought at reasonable valuation. Picking the right stocks in the mid-cap space, however is not easy given the higher rate of mortality (or failure) compared to large-cap stocks. Mid-caps also carry greater promoter risks as their management and ownership is dominated by individuals and families. Secondly, while many of these are also less tracked by analysts, some may even have corporate governance issues. That is why, it is advisable to stick to mid-caps with sustainable financial metrics rather than those offering the promise of faster growth. Filtering out companies based on such metrics provides a higher degree of downside protection during volatile times. In a bid to pick some worthy mid-caps, we restricted our universe to the top 500 non-financial companies in India -- companies ranked 251 to 750 in BS1000 rankings for 2019. These companies were than ranked according to their financial sustainability index (FSI) in FY2018 and the top 50 companies were then considered for final selection. FSI measures a company's financial strength and broadly its earnings and balance sheet quality. A company ranked higher on FSI offers a combination of lower debt to equity ratio, high level of revenue to assets, greater retained earnings and high conversion of net profit into operating cash flows. To weed out very small firms with volatile earnings, companies were also ranked according to the size of revenues and market capitalisation. Among the top 50 companies in terms of FSI, we selected those stocks where current valuation is lower than at the peak of the market in 2018 and are currently showing faster revenue and earnings growth than in FY2018. 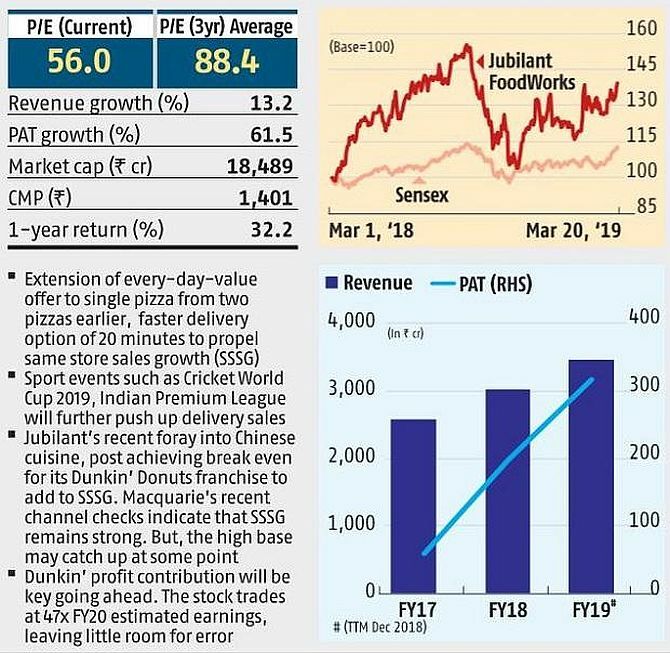 Extension of every-day-value offer to single pizza from two pizzas earlier, faster delivery option of 20 minutes to propel same store sales growth (SSSG). Jubilant's recent foray into Chinese cuisine, post achieving break even for its Dunkin' Donuts franchise to add to SSSG. Dunkin' profit contribution will be key going ahead. Focused engineering and industrial player, positioned as industrial software company. Operates in niche segments like building control, processes and systems, home comfort solutions and mobility. This has helped the company stay afloat, when market conditions were extremely unfavourable. 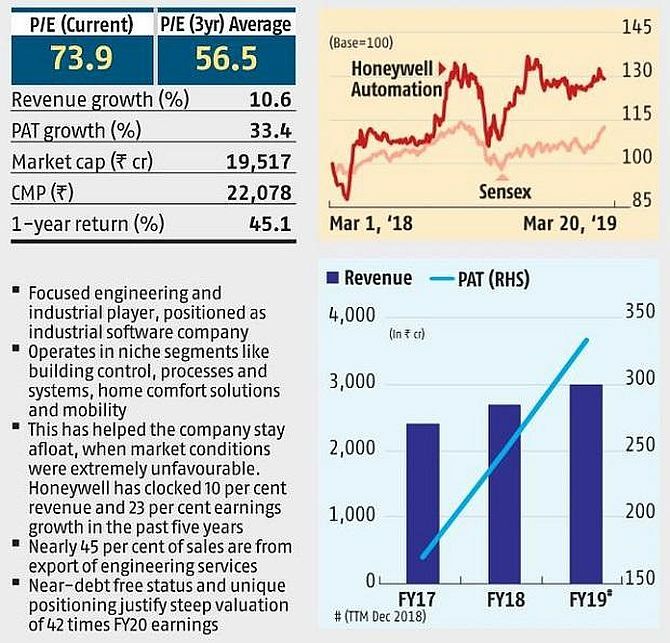 Honeywell has clocked 10% revenue and 23% earnings growth in the past five years. Nearly 45% of sales are from export of engineering services. Near-debt free status and unique positioning justify steep valuation of 42 times FY20 earnings. Beneficiary of stringent safety regulations with a near monopoly status in the medium and heavy commercial vehicle braking systems solutions. Implementation of BSVI norms by April 1, 2020 will lead to pre-buying, while scrappage policy is expected to boost aid volume growth. MNC parent's focus on India as a low-cost outsourcing hub to boost exports, which accounts for 30% of Wabco's overall revenues. Braking related content per vehicle in India at $500 is much lower than the averages of key global auto markets, thus offering new growth opportunities. Given the rising content, revenue growth is expected to be over 16% in the next couple of years, higher than the growth of commercial vehicle industry. Wabco's debt-free balance sheet, strong cash flows and healthy return ratios are positives. With presence in automotive and broadcasting segments, Tata Elxsi is a unique player in the information technology space. The stock has been under pressure due to weak December quarter earnings and dependence on its sister concern, Jaguar Land Rover as a key automotive client. 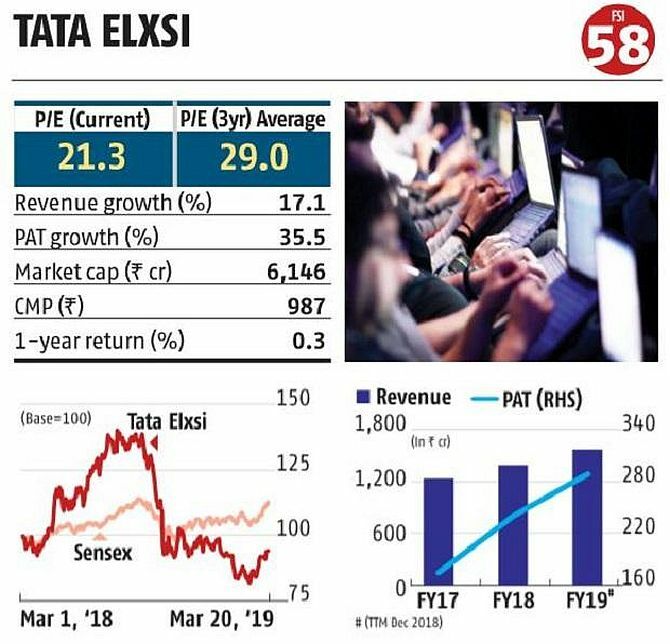 With operating and net profit margins once again reclaiming the 25% and 16% mark, respectively in Q3, analysts at Motilal Oswal Financial Services are confident that Tata Elxsi will grow its revenue and net profit by 18% each in FY20. As auto companies continue to invest in R&D and OTT (over the top) applications gaining traction in India, the company's long-term prospects remain secure. Growth to be led by high-margin portfolio of insulin products, while others such as respiratory are adding to incremental growth. Well-known products in pain control, anti-allergic brands like Combiflam, Allegra too command strong market shares in their respective categories. 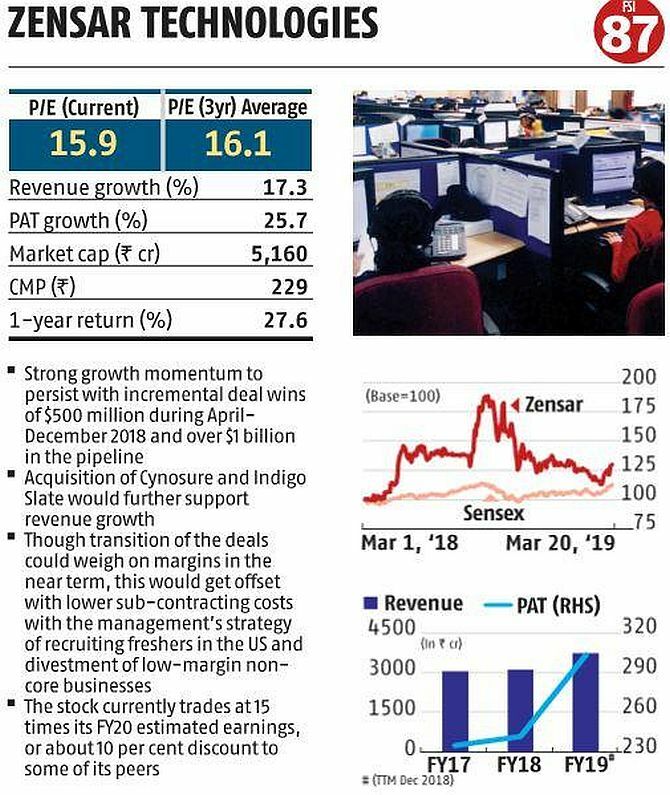 The volume-led growth in portfolio that came under price control a few years ago, too is a positive with some price hikes aiding in revenue growth. 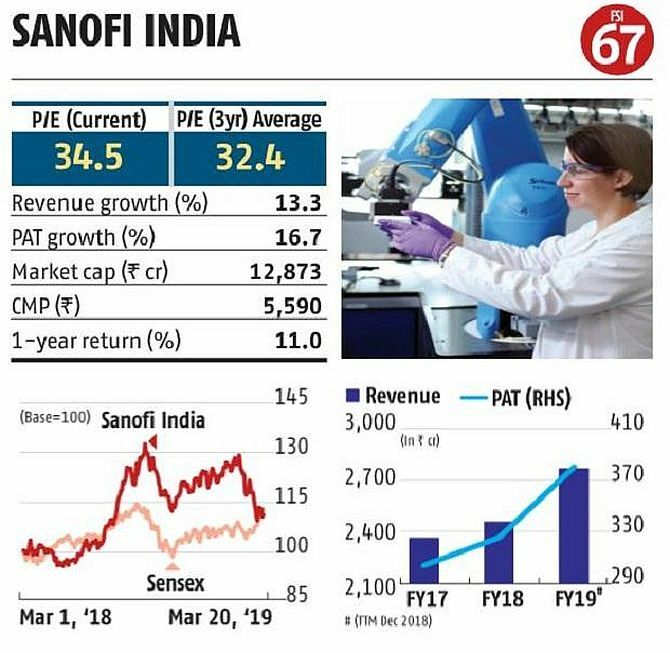 Sanofi's exports to Europe continue to get traction from strengthening of euro versus rupee in the last one year. Analysts say the stock is trading at 30% to 40% discount to other MNC peers and offers good growth prospects. SKF enjoys leadership position in the domestic bearings industry with a market share of 29%. Launched multiple new products in the auto segment to bridge product gaps. Doubling of annual capex over the next two years should provide additional capacity and enable the company to cater to higher demand. Margins are expected to increase by 100 basis point over the next two years on cost efficiency and lower input costs. 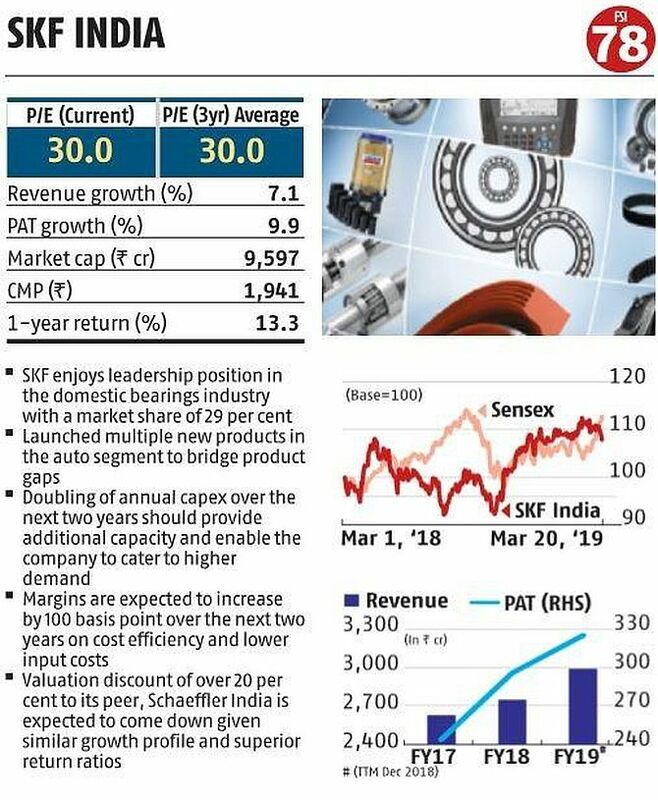 Valuation discount of over 20% to its peer, Schaeffler India is expected to come down given similar growth profile and superior return ratios. Strong growth momentum to persist with incremental deal wins of $500 million during April-December 2018 and over $1 billion in the pipeline. Acquisition of Cynosure and Indigo Slate would further support revenue growth. Though transition of the deals could weigh on margins in the near term, this would get offset with lower sub-contracting costs with the management's strategy of recruiting freshers in the US and divestment of low-margin non-core businesses. The stock currently trades at 15 times its FY20 estimated earnings, or about 10% discount to some of its peers. HIL is a well-positioned and established name in roofing and building solutions. Ramping up of pipe capacity, a strong brand and robust demand are expected to boost the topline. Analysts expect the shift to solution-based model from the product-based one to result in around 24% annual growth of building solutions business. Roofing business is expected to deliver around 8% compounded annual growth rate going ahead. 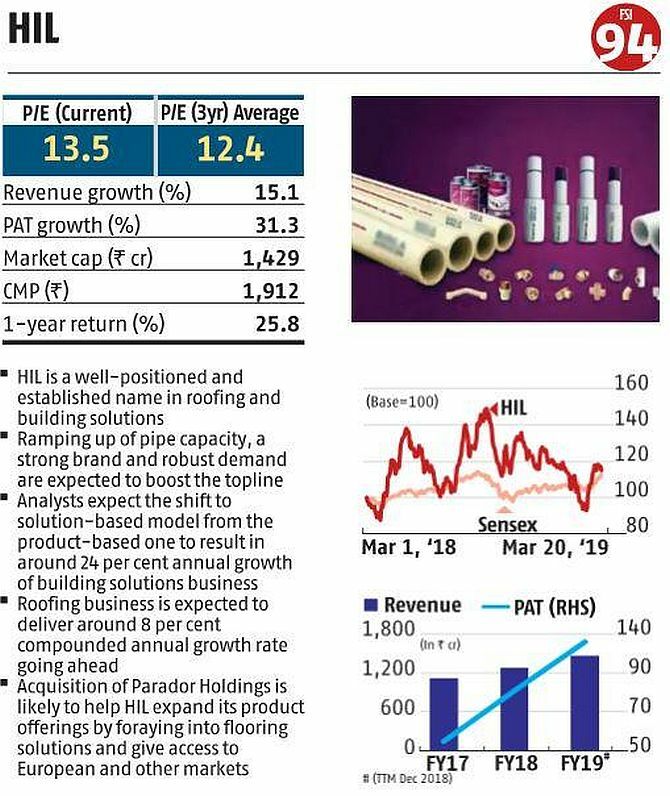 Acquisition of Parador Holdings is likely to help HIL expand its product offerings by foraying into flooring solutions and give access to European and other markets.